Heart of the Story: The prophet, Hanani, reprimanded King Asa of Judah because he relied on the Syrians to protect him and his country rather than God. Background: Asa was king of Judah when Hanani was a prophet in Judah. Asa reigned 41 years. For the most part, King Asa was loyal to God. He initiated reforms through the land he ruled that returned citizens to God worship. In Asa’s 36th year as king over Judah, King Baasha of Israel initiated a war with Judah. King Baasha built up the town of Ramah along a main road into Jerusalem. Trade from northern lands into Judah dried up. In response, King Asa took gold and silver from the Temple and sent it to Ben-hadad, King of Syria. The money was a bribe so that the Syrian king to turn against his ally, Israel. As a result, Israel would abandon Ramah. 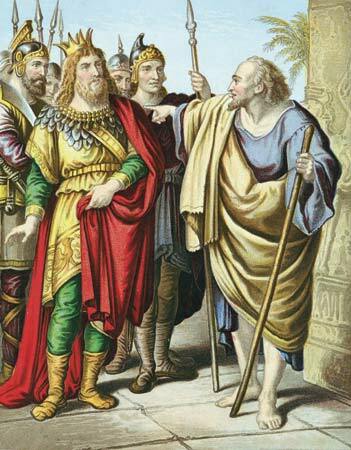 King Ben-hadad accepted the bribe and sent his armies against Israel. When King Baasha heard about King Ben-hadad’s actions, he abandoned Ramah. You relied on King Ben-hadad rather than on God to get you out of this situation. Did you forget how God delivered the huge armies of Ethiopia and Libya into your hands because you relied on God? Because of your choice to rely on Syria rather than God, you will have wars during the remainder of your reign. King Asa was angry at Hanani because of his words. Asa put Hanani in prison in the stocks. Pondering Relationships: Overall King Asa was one of the good kings of Israel, however, he rejected the truth the Seer, Hanani, spoke to him. The reasons for King Asa’s anger at Hanani could have been threefold. 1) Perhaps, Asa did not want to be reprimanded from a lowly prophet although the prophet spoke the words of God. After all, Asa was king of Judah. He was from the royal linage of Kings David and Solomon. Asa was proud and not used to having his decisions questioned. 2) Perhaps, King Asa knew Hanani was correct, that is, God did deliver the huge armies of Ethiopia and Libya. He should have turned to God rather than Syria. Certainly, he would have retained more the Temple treasury if he did so. 3) Hanani told King Asa, “For the eyes of the Lord run to and fro throughout the whole earth, to give strong support to those whose heart is blameless toward him. You have done foolishly in this” (1 Chronicles 16:8). No one, not a king, CEO, common laborer, or house wife wants to be told that they acted foolishly. Perhaps, King Asa’s anger at Hanani was because this prophet had the audacity to use the word “foolish” in conjunction with King Asa. Importantly, the seer Hanani did not tell King Asa that he was foolish, only that he acted foolishly in the situation. Probably, we all have or will act foolishly at some point. Because of King Asa foolish decision, he would have to suffer consequences, that is, wars the remainder of his reign. We don’t know how long Hanani remained in prison or in the stocks. Perhaps it was days, weeks, months, or years. We do know that Hanani gave his message in the 36th year of King Asa’s reign and King Asa reigned 41 years. Often new kings freed political prisoners such as Hanani, but some kings did not. Perhaps, the prophet Hanani died in prison. Reflection: Is it fair that God’s prophet had to suffer for speaking God’s words? This entry was posted in Prophets and tagged Ben-hadad, Bible Study, Carolyn Roth Ministry, Judah, King Asa, Lesser Known Bible Characters, Obscure Characters, Prophet Hanani. Bookmark the permalink.